The perfectly in sync judicial body delivers its passionate majority opinion. WASHINGTON—After months of deliberation, the Supremes Court, the soulful judicial body that oversees federal matters of the heart, issued a historic decision in the case of Holland v. Baby, Baby, opting to uphold the practice of stopping in the name of love by a 2-1 vote. "The court has given careful consideration to arguments from both sides, and tried so hard, hard to be patient," Justice Cindy Birdsong said in her well-choreographed majority decision. "It is our opinion that stopping in the name of love is not only the compulsory duty of the philandering party, but it would be irresponsible for him to do otherwise, pursuant to the aforementioned instances in which we have been both good and sweet to you, as well as the imminent risk of breaking the court's heart." Added Justice Birdsong, "Think it o-o-ver." This case marks the first challenge against the stopping-in-the-name-of-love doctrine first established more than 40 years ago by the Supremes Court, the nation's highest judicial trio, which presides over the federal government's Motown branch. The Supremes Court has set numerous anti-heartbreak precedents since that time, including the 1964 overturning of Georgia's breaking-up laws in favor of more lenient kissing/making-up statutes, and a 1966 decision that deemed unconstitutional the practice of hurrying love, which was determined to be in direct violation of what the court's mama said. Although some analysts speculated enough time had passed for the impartial, perfectly harmonized justices to get over it, with this near-unanimous decision, the court once again demonstrated a hard-line stance against messing around. Some critics have said that the latest ruling shows an unethical bias that could affect the court's upcoming decision in the case of the People of the State of California v. This Feeling Inside Me. "We have concluded this matter is not just a simple abstraction," Justice Mary Wilson explained in a written statement. "The language of the Constitution is unclear on the matter, but it is the court's belief that, had the framers known of your secluded nights, they would have done anything to prevent losing you forever. Including supporting a 28th amendment to force you to stop this infatuation. Ooo." Assistant attorney Lamont Dozier, who spoke on behalf of romance-related halting, said he was overjoyed with the court's ruling. "Today, the highest court of soul has spoken for every citizen who has ever had someone take their heart and leave them sad," Dozier told reporters. "I must confess, I became so emotional when I heard them read the decision that I cried tears for those who had never felt the joy we felt and, for a moment, experienced an auditory hallucination of an orchestral performance." 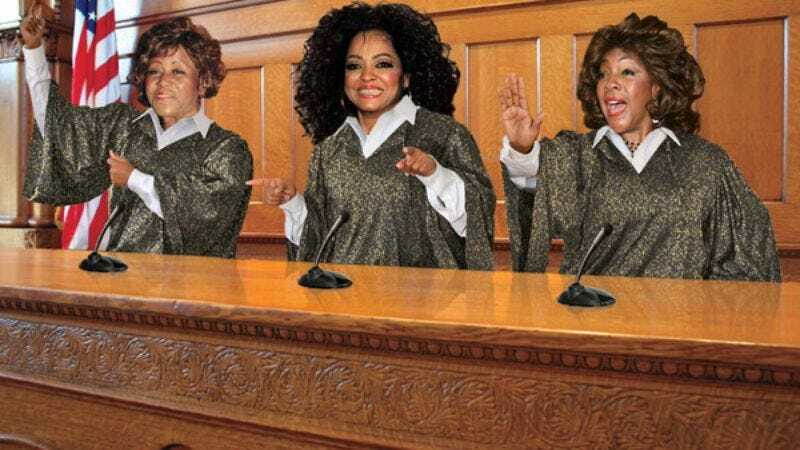 While it was thought the court would hand down a unanimous ruling on the case, Chief Justice Diana Ross provided the sole dissenting opinion, saying that she could not endorse a blanket decision that did not take into consideration the varying degrees of love. "As an individual, I emphatically support stopping in the name of love," Justice Ross said in her five-page written dissent. "However, I believe it is a states' rights issue and should not be legislated from the highest offices. Additionally, it should be noted that the so-called 'love' referred to in this instance has already been wasted and, in fact, may have been nothing more than a handful of promises. Therefore, I believe it is imprudent to waste further tears on reflections of the way life used to be, reflections of the love you took from me." Ross then returned to her private chambers without making eye contact with the other two justices. Justice Ross's written statement has fueled already existing speculation that she may be attempting to draw the court in a more Berry Gordian direction—one that would grant greater authority to the position of chief justice than is given to the Supremes Court as a whole—particularly following the abrupt departure of Justice Florence Ballard. Congress is expected to support the stopping-in-the-name-of-love ruling by passing a round of legislation first proposed by Sen. Richard Burr (R-NC) last year when his wife was caught running around with the gardener.